I have been playing guitar for thirty-five years and am a versatile instructor in many styles. 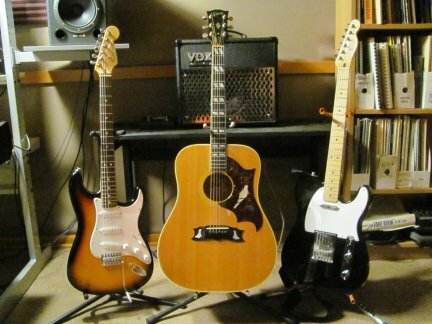 I teach acoustic and electric guitar and also bass guitar, which was my first instrument when I started playing in bands in 1969. The beginning student learns the basics: names of strings, how to tune, the names of notes on the guitar neck, and then about eight basic chords. Strumming rhythms and how to play ten songs with three chords--G, C and D--are followed by exploring picking techniques, lead guitar styles (Chuck Berry, blues, jazz, rock) and then a focus on the student's musical interests. We will play along with CDs and with "Music Minus One" tracks that allow the guitarist to solo over a professional rhythm section (bass, drums, keyboard) provided by the Jamey Aebersold series of 'playalong" CDs.